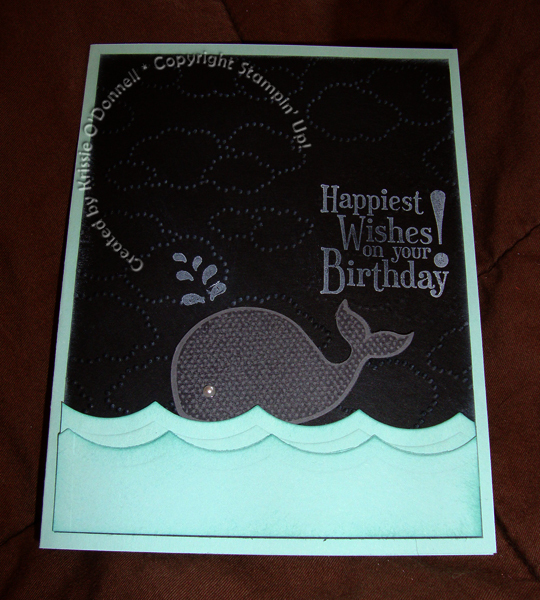 Oh, Whale has got to be my absolute favorite stamp set in the Spring catalog. It could be that its because I’m having a little boy and a lot of Carter’s line right now has cutie little whale clothing…. but the whole product suite set up around this set just makes me smile. I’ve always loved rainbows and the DSP in the product suite uses a pretty spectrum. So why didn’t I use any of that prettiness on this card? Because I’ve also really liked seeing the chalkboard technique and wanted to try it out myself. There are a few different ways of going about this technique and I used one that utilized our products the best. A simple sponging of White craft ink around the edges and on top of the cardstock (with a light hand!) I also had to emboss with the cute new clouds embossing folder. So, I sponged over those too! I made the mistake of embossing before stamping my sentiment… oopsie, so I used a wide marker (capped) to “erase” some clouds to have a place to stamp. I will give my stampers the option of either doing what I had to do to cover up my boo-boo, or having them stamp first, but I think having the flat space does look nicer. I made some waves with the scallop edgelit, and what a selling point for this stamp set, there’s a clearlits die that lets you punch out the whale! LOVE it! I added a pearl to highlight the eye and did some more chalkboard effect with his little water squirts!